Angel playground offer outdoor play structures with wide range of theme, combine exciting fitness challenges with traditional play system bring maximum fun and exercise for kids. Kids will be moved by our innovation design and quality play events. With our high standard handiwork and plenty choice on components, bring kids play experience to a new level. Angel playground brings a new level of precision and easy assembly pattern to fun fitness. Offer easeful, stronger, safety and environment-protect play system for kids to explore their ability, to challenge their physically, to develop their social skill. These active and fun structures help parents and educators successfully guide children in cognizing and developing their physical habits. Fun fitness make up the gap between school and practical play time. The main function of Fun fitness is that can attract kids do more exercise and never get boring. With better material on plastic and metal components, using new standard on producing, common play structure can stand on ground for decades. 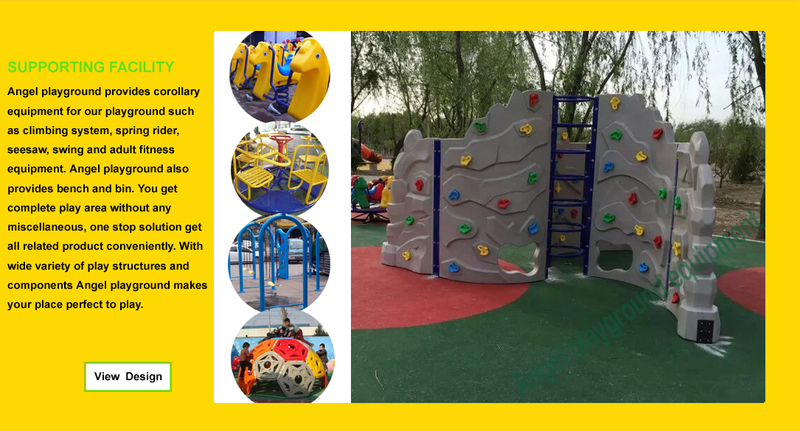 The advantage for common playground is on price, with same function and quality, price can down 30% compare with Themed playground. For kids at development county and faraway region, or institution which lack on budget can pick this series. 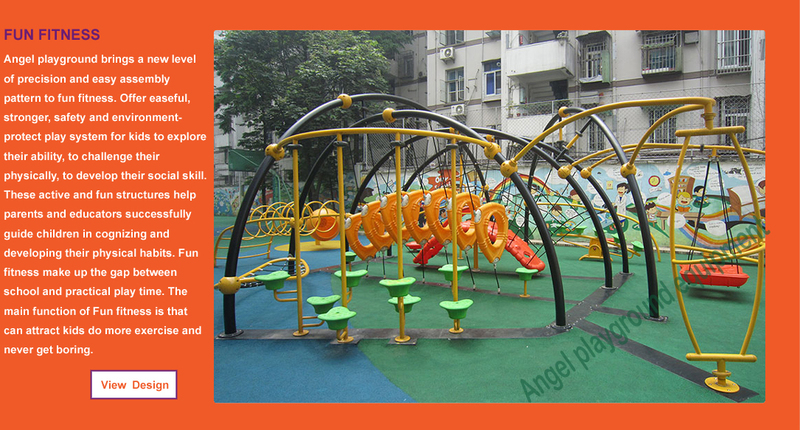 Angel playground provides corollary equipment for our playground such as climbing system, spring rider, seesaw, swing and adult fitness equipment. Angel playground also provides bench and bin. 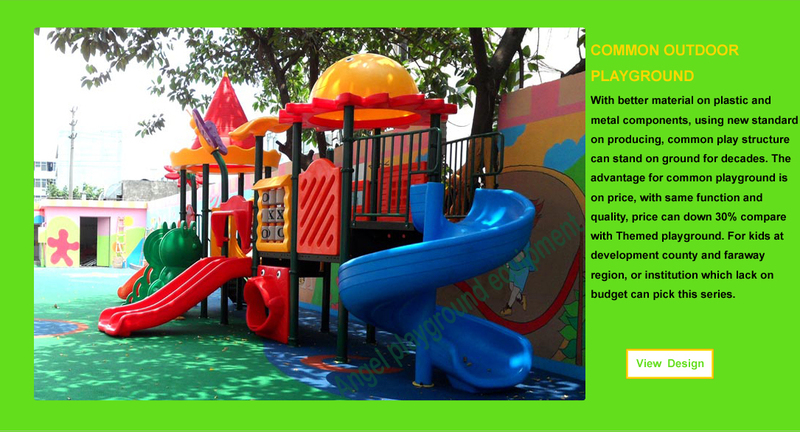 You get complete play area without any miscellaneous, one stop solution get all related product conveniently. 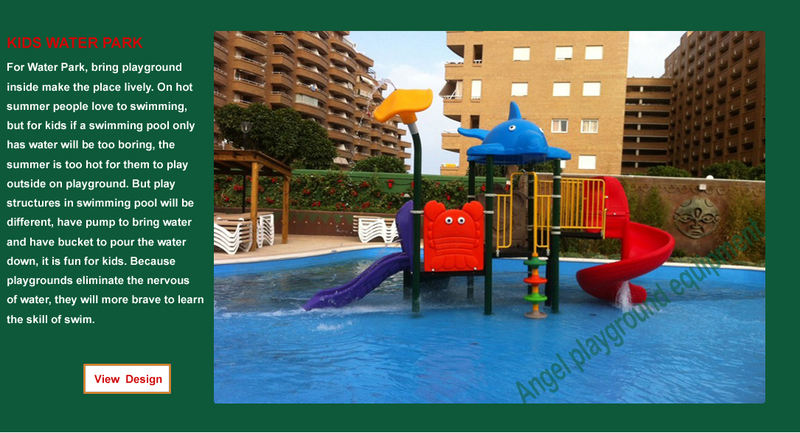 With wide variety of play structures and components Angel playground makes your place perfect to play. To outstanding your park with others, you need unique design and rich-in imaginative play events. Angel playground constantly innovating new ideals to help kids do more exercise; they are free to sliding, climbing, swaying, spinning and swinging on our innovative play system. Go through our entire product line chose your most favorite design, contact to our designer find the quality and creative play system that kids truly love. 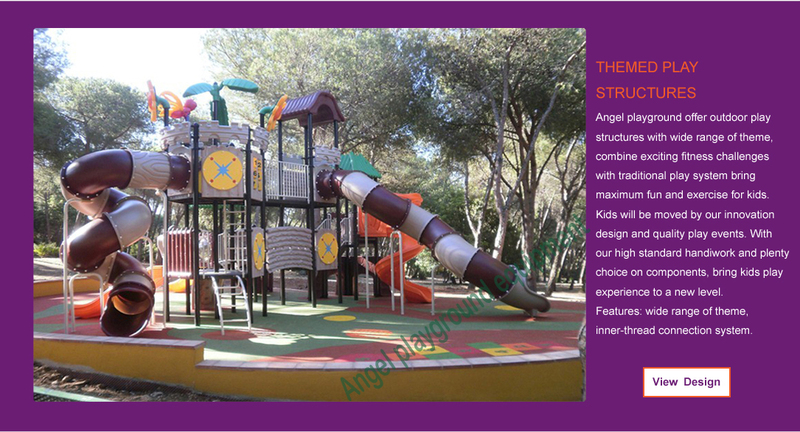 Angel playground equipment provides creative and challenging play structures for kids between ages 2-5. Such integrate play system encourage physical and cognitive development. Age-appropriate products are perfect solution for little buddies to have fun while developing their bodies and minds. For institution like kindergarten, daycares center or anywhere which need help kids to developing strength, social skills, cognitive and coordination, small size playground is perfect solution. 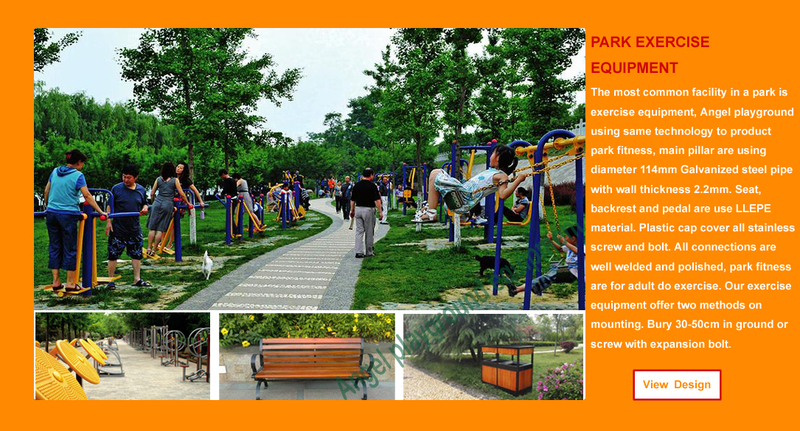 The most common facility in a park is exercise equipment, Angel playground using same technology to product park fitness, main pillar are using diameter 114mm Galvanized steel pipe with wall thickness 2.2mm. Seat, backrest and pedal are use LLEPE material. Plastic cap cover all stainless screw and bolt. All connections are well welded and polished, park fitness are for adult do exercise. Our exercise equipment offer two methods on mounting. Bury 30-50cm in ground or screw with expansion bolt. For Water Park, bring playground inside make the place lively. On hot summer people love to swimming, but for kids if a swimming pool only has water will be too boring, the summer is too hot for them to play outside on playground. But play structures in swimming pool will be different, have pump to bring water and have bucket to pour the water down, it is fun for kids. Because playgrounds eliminate the nervous of water, they will more brave to learn the skill of swim. You need soft surface to absorb the impact of unexpected fall. 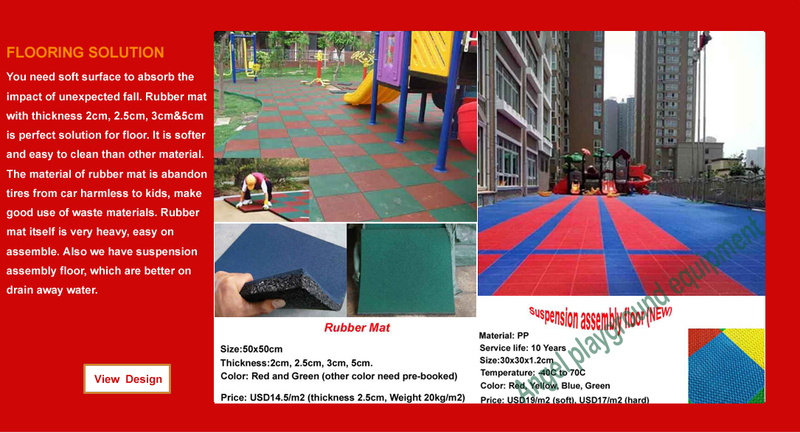 Rubber mat with thickness 2cm, 2.5cm, 3cm&5cm is perfect solution for floor. It is softer and easy to clean than other material. The material of rubber mat is abandon tires from car harmless to kids, make good use of waste materials. Rubber mat itself is very heavy, easy on assemble. Also we have suspension assembly floor, which are better on drain away water. 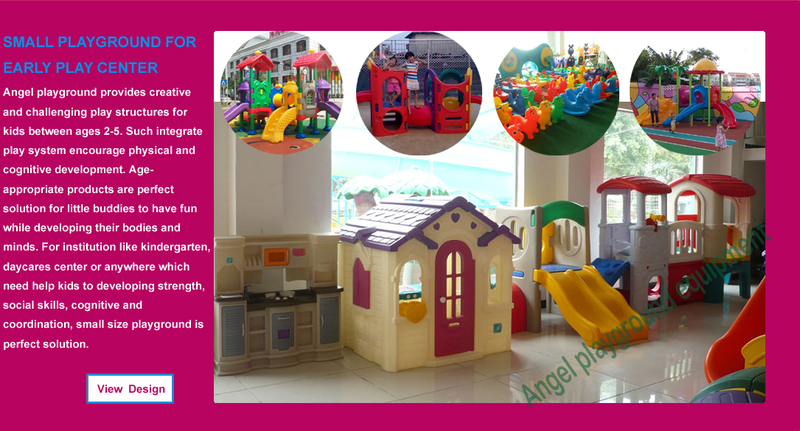 Angel play structures can be used standalone also can be connected to each other, you are free to image the combination. 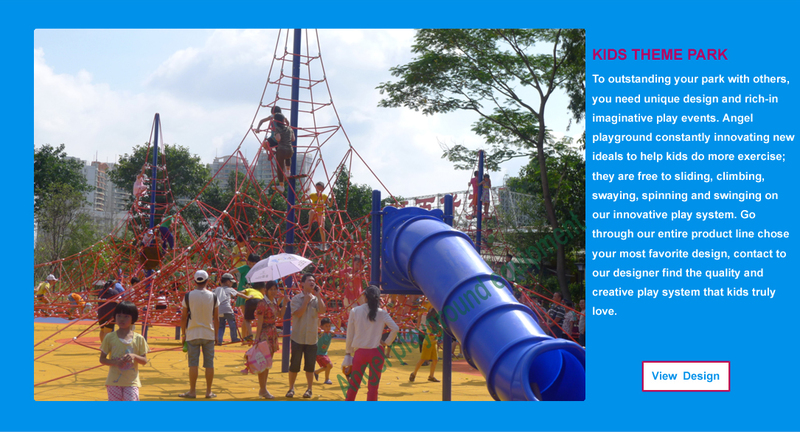 Angel playground throng with you to create a true adventure playground which can inspire kids.